The update out now, but the holiday event doesn't start until tomorrow. After briefly being postponed, Fortnite’s 7.10 update is live now. Unfortunately, Epic’s still tinkering away on the driftboards, so you won’t be sliding around on them just yet, but you will be able slide across icy surfaces using other ground vehicles. The update brings quite a few changes with it, especially for stormwings, but the main event, 14 Days of Fortnite, doesn’t kick off until December 19. 14 Days of Fortnite will throw new and returning limited time modes at players every day. Large team modes will switch every two days, while smaller ones will rotate every 24 hours. The event begins tomorrow, December 19, at 9am ET. The LTMs remain a mystery, for now, so we’ll have to log in to find out what shenanigans are on offer. New challenges offering free rewards will also appear every day. In addition to all the LTMs and challenges, the map’s had a wee makeover, again. There are festive touches, like holiday-themed bushes and battle bus, and you’ll be able to find a snowball launcher and weaponise the weather. Among 7.10’s list of changes are some big ones for stormwings. They now take 50 percent more damage from hitting objects, and boosting will only reduce damage by 50 percent, instead of all the damage. When a stormwing is shot down, the damage done to the player has been doubled, bumping it to 50. It’s going to be riskier, then, and ramming buildings isn’t going to be quite as attractive to pilots from now on as they now take more damage if they fly through a structure to destroy it. Creative mode tinkerers now have new winter islands and prefabs to play with, too. There are four islands and six winter village prefabs, which you can spruce up with the new holiday prop pack. 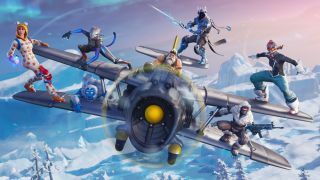 Save the World, meanwhile, has a new mission: Frostnite. It’s a survival-themed romp where you’ve got to keep the heater burning and defeat monsters without gear or resources, using only your survival skills and starter weapons. 7.10 is out now, and you can check out the patch notes here. And here's everything we know about Fortnite Season 7.